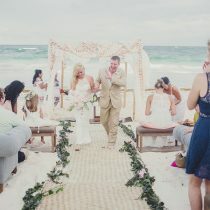 A vast ocean beach, a sea of flowers, lavish decoration in delicate pink, live music, and the incredible beauty of a breathtaking sunset … How romantic is that?! 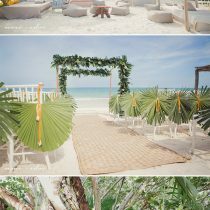 There could’ve not been a better location for the dream Dior wedding of the young Russian couple Alya and Oleg. This amazing destination wedding venue was discovered on the beaches of sunny Portugal. It had everything the young couple desired for their grand day – stunningly beautiful exotic scenery, inspiring romance and love – a real-life fairy tale of a prince and a princess! Alya and Oleg dreamt of a wedding unlike any other – top class elegance, individual style, chic ambiance, lavish decoration and warm welcoming coziness. In one word – Dior! And this is exactly what they received from the wedding planners. Their team made it all happen, till the tiniest detail. The young couple did not have to take care of anything, but just enjoy their big day and feel happy and blessed in the company of dear friends and family. Have a look at these spectacular photos and ….dream on!